Remember the last time you were away from home and waiting on an important phone call, but your iPhone’s battery was getting dangerously low? If you were lucky you had a charger with you. But chances are you don’t carry around a charger in your pocket and your phone died in the middle of that call. 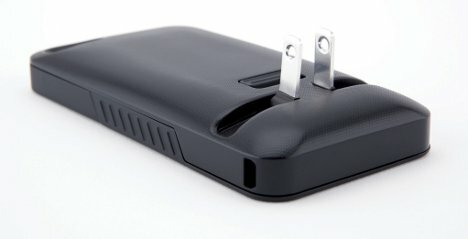 The JuiceTank is an ingenious iPhone case that would eliminate issues like this by putting the charger right on the case. The plug prongs fold down so that the metal bits don’t dig into your thigh when your phone is in your pocket. And when you need to top up your battery, you just fold out the prongs and plug the whole thing into a wall outlet. Since the case stays with your phone all the time, there’s no need to worry about getting caught away from home without a charger cable. The project is raising funds on Kickstarter currently; if it’s funded the JuiceTank will be available for purchase in the next few months.